The Wormskin fanzine, published by Necrotic Gnome Productions is written for use with Labyrinth Lord and issue by issue, details an area known as Dolmenwood, a mythical wood, an ancient place of tall trees and thick soil, rich in fungi and festooned with moss and brambles and rife with dark whimsy. Wormskin No. 1 was published in December, 2015, and was followed by Wormskin No. 2 in March, 2016. Both issues introduced the setting with a set of articles rich in flavour and atmosphere, but lacking a certain focus in that the region itself, Dolmenwood, was not detailed. Fortunately, in March, 2017, Necrotic Gnome Productions released Welcome to Dolmenwood, a free introduction to the setting. What both Wormskin No. 1 and Wormskin No. 2 also suffered from was a similarity of content, both issues being dominated by articles, ‘Fungi of Dolmenwood’ and ‘Psychedelic Compounds’ respectively, that detailed the harvesting, effects, and prices of their subject matters, in a shared format. The result was two articles that felt very much the same despite the differences in subject matter. Fortunately, Wormskin No. 3, published in July, 2016, utterly lacks such an article, and so is much better issue for it. The issue opens with ‘Of Men, Goats, and Fairies in Dolmenwood’ which presents a history of the region stretching back some two millennia. It takes us from its origins as fairy region under the sway of the Cold Prince through centuries of incursion by mankind. First the Drune, human sorcerers, and Drune-wives or witches who treated with the Cold Prince and discovered and mapped the powerful ley lines that run throughout the forest as well as raising the many ley stones and circles from the earth itself. Then men of the One True God came, building Castle Brackenwold and founding the Kingdom of Brackenwold which would one eventually be annexed by a neighbouring kingdom as the Duchy of Brackenwold. The Cold Prince’s interest in the mortal lands waned and he would be banished to his own realm, thus freeing his Goatmen servants to cavort and rule as they like—many still do to this day. In more recent times the Abbey of St. Clewd was sacked in a night by forces unknown, the Drune have retired deep into the forest facing persecution by the Church of the One True God, and dark forces have occupied the northern half of Dolmenwood. The truth of the matter is that after the obfuscatory nature of Wormskin No. 1 and Wormskin No. 2, ‘Of Men, Goats, and Fairies in Dolmenwood’ is a revelation. It lays the groundwork for Dolmenwood as a setting and provides an explanation for various elements that appear in the first two issues. Fundamentally it provides so much of the context that was missing from those issues that it begs the question, “Why was this not the very first article to be published for the Dolmenwood setting?” ‘Of Men, Goats, and Fairies in Dolmenwood’ is followed by ‘Languages of Dolmenwood’, which quickly runs through the languages spoken and not spoken throughout the region from The Immortal Tongue of Fairy and High Elvish spoken by the fairy nobility to Liturgic, the language of the Church of One True God, and Woldish, the dialect of Common spoken throughout the region. Other languages include Caprice, the bestial tongue of the Goatmen and Drunic, the secret language known only by the Drune. Together, ‘Of Men, Goats, and Fairies in Dolmenwood’ and ‘Languages of Dolmenwood’ also highlight some of the cultural differences and relationships between the inhabitants in the region. Between the Goatmen and mankind, between the Church of the One True God and the Drune, and so on. It is also possible to draw historical parallels here too—at least as reference points—between Christianity and pagan faiths, that add verisimilitude to the Dolmenwood setting. Depending of course, how far a Referee wants to draw such parallels. Numerous Ley Lines run through Dolmenwood and the region is rife with standing stones, stone circles, and megaliths. In the southwest of the region is a feature that combines all three. Stones known as the Summerstones form a great circle called the ‘witching ring’, a circle so large that it encompasses Lake Longmere. ‘The Summerstones and the Witching Ring’ details the ring and the individual stones as well as what would happen should the ward they create ever be broken. This delves into the nature of one of Dolmenwood’s major secrets—other articles hint at more—as in, just what is the ‘witching ring’ protecting? In the process, it ties back into both the history of the forest and into the discussion of the region’s languages and begins to pull the setting together as more cohesive whole. ‘The Woods East of Lake Longmere’ continues the work begun in ‘Lankshorn and Surrounds’ and ‘The High Wold’ in Wormskin No. 2 in presenting a gazetteer of Dolmenwood. Those articles detailed, hex by hex, the region known as the High Wold which lies to the south and west of Lake Longmere. 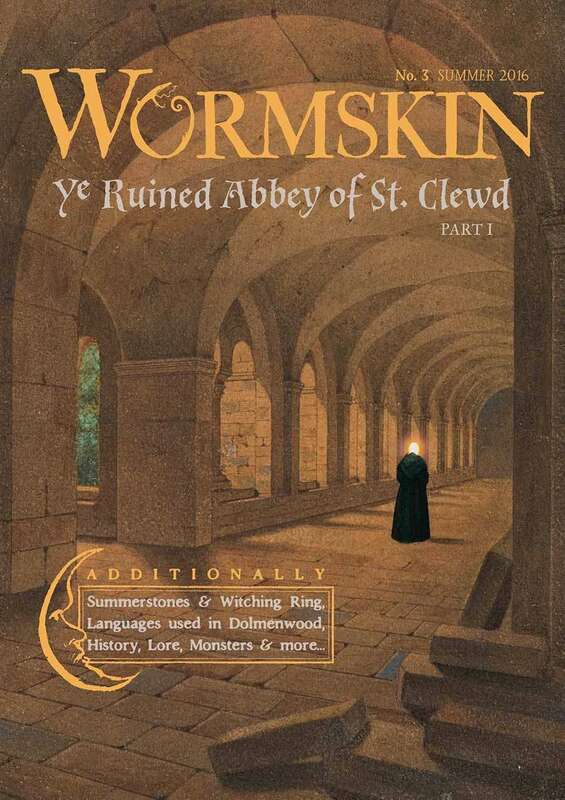 The article in Wormskin No. 3 focuses on the region, again hex by hex, to the east of the lake. In these seven hexes can be found a phantom isle on the lake that is home to a black elk-goddess; a summerstone that radiates smothering romance by day and carnal lust by night; a strange column of chalk carved with hundreds of names; and a shrine to Saint Vinicus, patron saint of mice and beggars. Also located here is a ruined abbey, once dedicated to Saint Clewed, but sacked mysteriously one night almost four centuries ago and the subject of its own article. Like the gazetteer in Wormskin No. 2, these locations are accompanied by an excerpt from the fuller map of Dolmenwood. This is placed on the back cover and blown up to provide plenty of detail, a nice touch being that the map excerpt—presented in full colour—is framed as if it was a church window and the map done in stained glass. 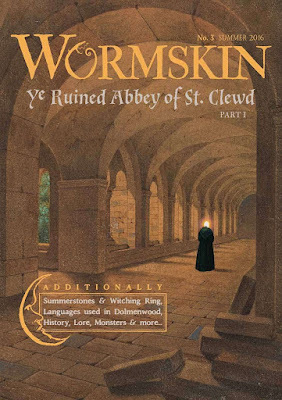 ‘The Ruined Abbey of St. Clewed’ is the first part of a two-part series which will be completed in Wormskin No. 4. It describes the ruins—above ground level, the second part will describe the ruins below ground—of the abbey that was originally built upon the site where Saint Clewed died fighting and defeating an evil black unicorn. Supposedly there is a secret vault below the ruins which are also thought to be home to both brigands who kidnap and hold children to ransom and the ghosts of the monks who died when the abbey was sacked. Just six locations are given in the grounds of the ruined abbey, but they are described in some detail, more than enough to keep an adventuring party occupied until the Referee has access to the second part. The majority of the encounters in the grounds are of a relatively low level, suitable for player characters of between First Level and Third Level, but there are much more dangerous foes present too, so the Referee will need to be careful not to overwhelm the party. Accompanying the article is a set of tables for creating Ghostly Monks. These wander the grounds of the abbey and each has his own personality as well as a wish—to have his body buried in the abbey or its gardens restored, in return for which a monk may impart a secret about the abbey. The Referee should have fun portraying these monks, who should be in turns infuriating and helpful. Rounding out Wormskin No. 3 is ‘Monsters of the Wood’, a bestiary describing four of the creatures that appear in the articles contained in the issue. They include the Gloam, a undead thing consisting of Corvidae corpses who collect gruesome items and like to entice the innocent into their service, whilst the Mogglewomp is a fairy creature that likes to occupy the houses of its victims, all of the house in each and every case. Physically, Wormskin No. 3 is a step up in terms of quality and content over Wormskin No. 2. The fanzine is well written and engaging, the artwork is a good mix of original and public domain images, and colour is used judiciously. The higher page count also provides space for a wider range of content. There can be no doubt that Wormskin No. 3 is a huge improvement upon the first two issues of the fanzine and without the benefit of having read the subsequent issues, is the best issue to date. It lays the groundwork for what came before it and any subsequent content, and not just because the second part of ‘The Ruined Abbey of St. Clewed’ appears in the next issue. If there is a starting point for Wormskin as a fanzine, it is Wormskin No. 3—Wormskin No. 1 and Wormskin No. 2 are worth picking up, but only after Wormskin No. 3 gives them the groundwork they so badly needed.